Hello readers of John Heald’s blog. My name is Stan and I am pleased to be sailing aboard Carnival Legend, particularly on this itinerary. I will be writing the blog today, fully clothed, as John has buggered off somewhere and hasn’t been seen since we departed Estonia last night. How did I gain access to John’s computer, you ask? Well, I tried bribing John’s trusty cabin steward, Ketut, but he flatly refused to cooperate no matter how much money I waved in front of him. But when I offered to clean John’s cabin, including picking up his underpants, within seconds the door to John’s cabin was opened, I was given the password to his laptop computer, angels began singing, and Ketut hasn’t stopped smiling. My wife and I travelled halfway around the world, taking nearly a day and a half to get to the Carnival Legend, our home for twelve days. In my six cruises with Carnival, this was by far the fastest embarkation we have ever experienced; well under ten minutes from the time we stepped off the bus in Dover, got checked in, through security, and to our cabin. It is amazing the amount of support and logistics involved in getting guests from various airports around London to the ship. Also as amazing were the personnel at the port dedicated to getting us all checked in and safely on board. I am one of those who would prefer to get off the ship and go explore the city/country we are visiting. I do know a few people who would rather stay on board. Yes, the ship does provide ample activities to keep you occupied no matter what you choose to do on your cruise. But me, I’d rather go see and experience new places. For this cruise we were seated with two other couples in the Main Dining Room. In our case it worked out very well. One couple is originally from India but now lives in the US. The other couple is from Ottawa, Canada. So we have three different languages being spoken at the table, three different lifestyles, but we learned we all have one thing in common: we love to travel. By the time we left Finland, it became a part of each evening’s ritual to share what we all had done that day. One thing I’ve done on the last few cruises is ask our waiter why Carnival no longer serves the Baked Alaska flaming. I know why they don’t but the various responses the waiters give are hilarious, especially when they answer with a straight face. As is tradition when I sail with my wife, we dined in the steakhouse; The Golden Fleece here on Carnival Legend. I had the lobster this time. While it was delicious, I think I’ll stick to the steak in the future. I’ll talk more about the steakhouse later. We also took in a few shows in the Follies theatre and the Punchliner Comedy Club. It was at one of the comedy shows where my wife violated one of my cardinal comedy club rules; never sit in the front row. Yep, you guessed it. I got pulled up on stage. I had noticed the designs and artwork inside Carnival Legend and initially thought it to be a mishmash of style. Then I saw the interview with the designer of the ship, John Farcus, on one of the cabin television channels. He explained that the ship was named first. Then he was able to design the ship around the name ‘Legend’, and came up with the theme of legends from around the world. Next day I started paying more attention, and wouldn’t you know it, it all made sense! It is nice to learn new things, even when you are on vacation. We are still trying to get used to the sun not setting until 10:30pm, and trying to get used to 5 hours of twilight after that. It is pretty cool to stay up and watch the sunset, then watch the twilight…until you realize you have to get up in a few hours to start a shore excursion. Now, then. This is my first trip to Europe. I was very excited about this itinerary and booked our trip based on the ports we are visiting, specifically St. Petersburg. Leading up to our departure, John’s timely posts about how he was putting together the shore excursions, visa requirements in Russia, etc., just whetted my appetite even more. In addition to the tours, my must-do list included trying food from six of the seven countries we visited, including England. The descriptions of the Berlin Top 10 and 2-day Grand Tour of St. Petersburg covered most everything I wanted to see in the short time we’d be in those places so I signed up for those two well in advance. Though I prefer the warm weather, the Winter Wonderland excursion in Helsinki also sounded intriguing. Copenhagen – Here we took the Walking Tour of Copenhagen. Our guide was very knowledgeable and took time to tell us the history behind many of the sites we visited. 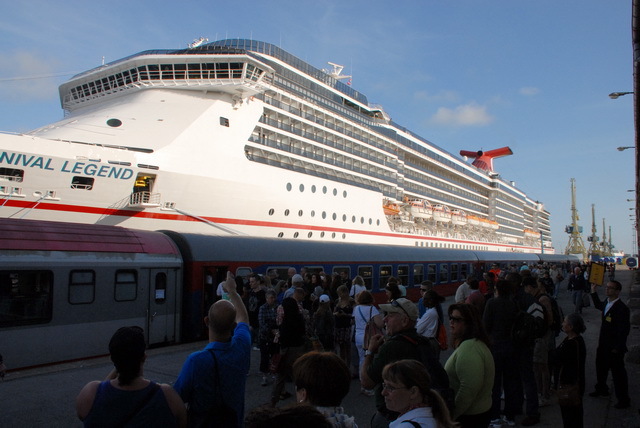 Copenhagen was very busy with five cruise ships in port. Our walking tour did cross paths with the large crowds but also took us along side streets well away from the other groups. I didn’t realize how many bicycles there are here. It would have been nice to have taken a bicycle tour of Copenhagen. (Dear beards: I am volunteering to test out any future bike tours Carnival may add to the shore excursion offerings.) One thing I really wanted to try but was not able to was an actual Danish. Our guide stopped at a bakery but only bought one Danish…to share amongst the entire group. We happened upon a music festival that was getting started soon. Unfortunately, the ship would be leaving well before the festival ended so we could not stay to watch it. A highlight for me was learning the legend behind the Gefion Fountain. Berlin – All I can say is Wow! Ok, I’ll say a bit more. The weather was perfect. The tour was perfect. Carnival chartered an entire train for Carnival Legend’s guests to take them to Berlin (kudos to Carnival for pulling that off), then arranged eight different tours once we arrived in Berlin. We took the Berlin Top 10 tour. This one takes you to see remnants of the Berlin Wall, the Holocaust Memorial, Checkpoint Charlie, and many other sites. The train ride through the German countryside en route to Berlin was very nice. Henning, our chaperone from the ship to the train station in Berlin, took very good care of our group. Sylvia, our guide in Berlin, was fantastic. Not only was she friendly and knowledgeable about the places we visited and the history of Berlin, she, herself, is from the former East Berlin and shared with us her perspective. A German lunch was provided. In the past, I did not like sauerkraut. That was until this lunch. And I am glad I listened to the voice in my head that told me to get an authentic curry bratwurst from a street vendor. My wife and I will definitely have to return to Berlin and spend a few days here. Helsinki – Originally, we planned to do just the Helsinki Highlights tour. But my wife decided later to include the Winter Wonderland tour. Putting aside my dislike for cold weather, off we went to an indoor winter wonderland where our guide, Ritva, told us a bit about Finland along the way. After donning cold weather gear provided by Unique Lapland, we went inside a cavernous room chilled to -5 °C/25 °F, and darkened to resemble the polar night. There we were served a shot of Finlandia (what else?) vodka provided in a glass made from ice. We rode an actual sled pulled by a team of sled dogs, skied a very short course on tandem skis, tobogganed, and visited three ‘ice hotels’ shaped like igloos. Returning back to the ship just in time for the Helsinki Highlights tour, we hopped aboard another bus and headed off to see these highlights. Our guide, Maria, narrated our trip and we had a few photo stops. I had never heard of Jean Sibelius, but after Maria taught us about him, I realized that I was familiar with his work. And at our last stop, a few minutes before the bus was due to return to the ship, we ran across a marketplace on the waterfront. Getting a chance to try reindeer meat in Finland was on my list of things I wanted to do, but with the tours we had scheduled and the short time we had here, the likelihood of finding any, let alone trying any, seemed highly unlikely. Sometimes wishes come true in the strangest of ways: what did one of the marketplace vendors have for sale? Smoked reindeer meatballs! Of course, I had to try them. Turned out they were among the best foods I have ever tasted! And the garlic sauce they added on the side made them even better. My wife found a street vendor that had some of the best veggie sandwiches she’s ever tasted. St. Petersburg – There’s nothing like visiting a place in person to dispel years of school history book teaching and Hollywood movie stereotypes. We’re on the 2-Day Grand Tour and so far it’s far surpassed my expectations. It’s hard to believe we’re actually in a country that not very long ago we were not allowed to travel to. Many of the people we spoke to admitted that St. Petersburg was the main reason they booked this particular itinerary. Natasha, our guide, was by far the best tour guide we have ever had on any of the Carnival cruises we have taken. Her knowledge was boundless. She was very patient and friendly. I wish there was a way to let her bosses know how good she is and how much her guests appreciated her professionalism. She led us on a whirlwind tour of St. Petersburg including Catherine Palace, the Church of the Resurrection on the Spilled Blood, St. Isaac’s Cathedral, and much more. Oh, I can’t forget about the authentic Russian lunch with borscht, champagne, vodka, and Beef Stroganoff. After a couple of hours on the tour, I was starting to read a few Russian words such as restaurant, bar, bank, and stop. I would need a week of writing John’s blog to cover everything we’ve experienced on just the first day here. Highlights in St. Petersburg were many but among them were: getting to use the few Russian words I know, my wife finding a gift shop owner who knew American Sign Language, and meeting two guys from Africa. We really wished we had more time to talk to them. Tallinn – By the time we reached Tallinn, I had come down with a cold. While visiting the old city and learning about the Russian and Swedish history of this city was interesting, all I really wanted was to go back to the cabin and drink some hot tea and sleep. We took the Jewish History tour, which included the old city. When we arrived back at the port and went shopping, we noticed the very high quality of the souvenirs in Estonia. Naturally, we bought several. The highlight happened in one of these shops: The proprietor spoke no English and I know absolutely no Estonian. Out of frustration I said, in Russian, “sorry, I don’t speak Russian.” Her eyes lit up and with a huge smile she responded with a torrent of words in Russian. I can’t explain it but it was if I was hearing her in English. That was an encounter I will never forget. In all honesty, I was disappointed that no bicycling shore excursion was offered in Amsterdam. From what I’ve been reading, Amsterdam is a very walkable city. Exploring it the way the Dutch do – from a two-wheeled perspective – sounds like the best way to see the city. Obviously, you cover more ground on a bike and that is exactly what I want to do while in Amsterdam, where we will be day after tomorrow. 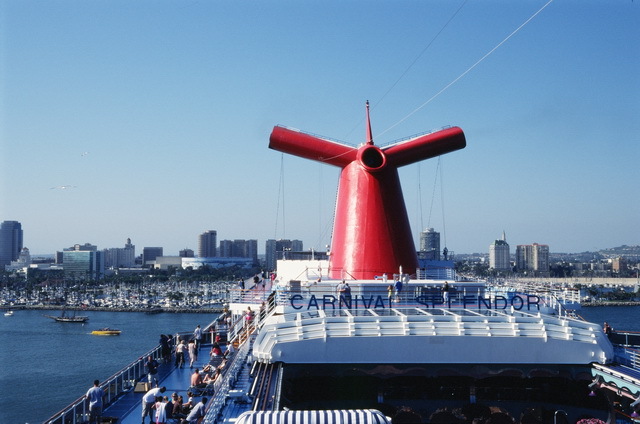 1 – On the Carnival.com site, add an “Insider Tips/Past Guest Picks” link on the Shore Excursions page listing things to do while in port, in between excursions, or at the arrival/departure port before/after the cruise. 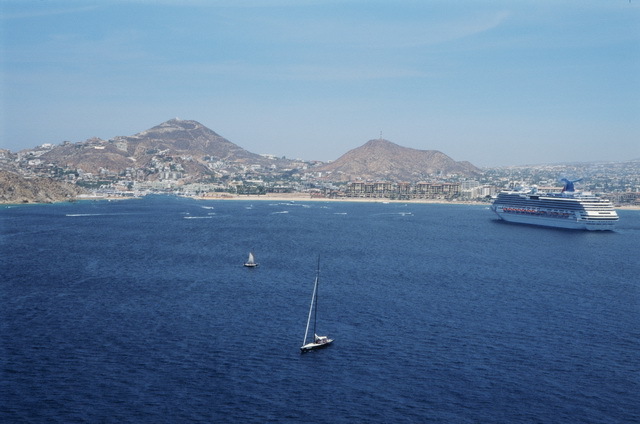 Example: “The Crazy Lobster in Cabo San Lucas is a few blocks from the marina and within sight of it. Easy walking distance. Excellent grilled steak, lobster, seafood, and traditional Mexican fare. Reasonable prices.” The legal beards can add a standard disclaimer that says these are ideas submitted by guests, not Carnival. 2 – Also on the Carnival.com site, make it easier to compare the Shore Excursions. Extend the descriptions on the Compare page so that you can read the entire description of each excursion without having to click ‘more’. Or, once you click ‘more’, have the description extend within the Compare column without opening a new page. As of now it takes forever because you have to: 1) scroll to find an excursion that interests you. 2) once you find it you have to click to get a full description. 3) then you either have to click the back button or click on Shore Excursions again and wait while the page loads all over again. This could literally take hours to read about all of the excursions if you have a slow Internet connection and are looking at a 7-day itinerary or longer. 3 – How about adding a ‘weather bug’ from Weather Underground or The Weather Channel on the shore excursion main pages on Carnival.com? 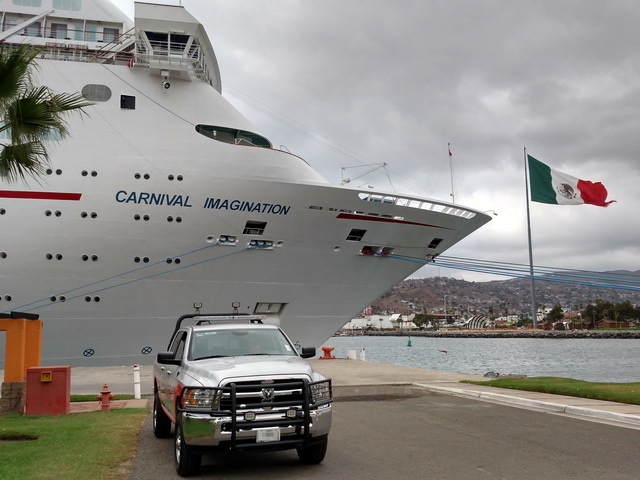 4 – In the Carnival Cap, er, Fun Times, add a section called “Cultural Tips” to the embarkation issue. Adding a few do’s and don’ts when visiting a foreign country on Carnival’s itinerary may be helpful. Example: In Russia, never turn down a glass of Vodka when it is offered. To do so is considered rude. Always drink it down all at once; do not sip. Pointing with the index finger, giving the ‘thumbs up’ sign, or the peace sign are considered insults in certain cultures. 5 – John has discussed this many times here in the blog. 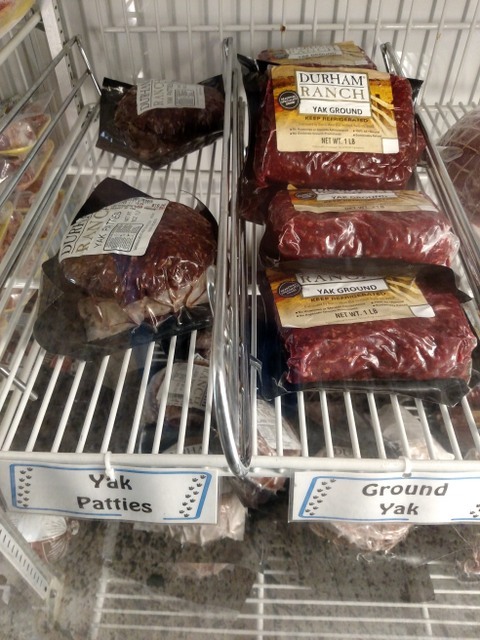 I can’t believe I’m about to say this, but I agree with many others who would like to see a vegetarian entrée option or two in the steakhouse. (Yes, I know it is a STEAKhouse.) There are starters and salads that are vegetablist friendly (sorry, John’s computer is taking over), but no entrées. Myself, I love a good steak. But my wife is a vegetarian and though we enjoy dinner together in the steakhouse, I feel bad because she doesn’t have anything other than appetizers and salad to choose for her main course. John and I talked about this on his Facebook page and he offered a brilliant (where’s that option to turn off the ‘Johnisms’ on this computer?) suggestion. I’d like to take his suggestion one step further: How about putting a note on the online Steakhouse Reservation page that says if you would like a vegetarian option to contact the Steakhouse a day ahead of your visit to discuss preparing something to your liking? The same note can be placed on the reservation confirmation placed in the cabin.